Firefly Cygnus Hybrid Power Generator (HPG) is a 5kVA hybrid solar generator. It is designed and manufactured in the United Kingdom, the 5.0kVA Cygnus adds to the solar generators available from cleantech industry leaders, Firefly Solar. 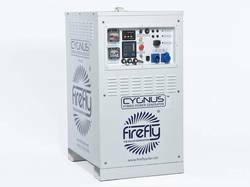 Cygnus adds to Firefly’s range of solar generators that all offer the reliability, flexibility and performance that your events and projects demand. Silent running and emission free electricity generation comes as standard with the Cygnus. Modified to Australian standard. The integrated, intelligent control panel provides you with the ability to immediately check the available remaining battery store as a percentage. The controller also gives you a wide range of real-time configuration options – all of which enable optimisation of the system based on its location anywhere in the world. Being forklift compatible and with a footprint of less than 1 square meter, Cygnus has the flexibility to have the built in battery bank charged using a number of sustainable sources from the Firefly range including: Fold-Array, items from the Kinectric range, wind turbine or by using the excess capacity of biodiesel or hydrogen generators or from a green mains supply. Operation of a Cygnus solar generator is incredibly simple, all connections are 'plug and play' so untrained users can install and uninstall the unit with ease. This solar generator can be used as a temporary stand alone power source for events, broadcast, or construction, as a permanent stand alone power source for rural locations and telecommunications, or as backup power with extended run times for locations with intermittent grid connection. The 5.0 kVA Cygnus is offered with a 1380Ah battery and has an increased peak power output 5.0kVA.